One of the simplest pleasures in life is sinking your teeth into a decadent piece of caramel. October not only signifies the return of delicious baked goods and Halloween candy, but it’s also National Caramel Month. We’ve compiled a few reasons we love this delicious treat, and have even listed some ideas that will help you celebrate all month long. We don’t know about you, but we can’t wait to get our hands on a piece of this ooey gooey goodness. One of America's most beloved candies, M&M's, launched a caramel-filled version of their famous treats. A Kraft Foods employee, Dan Walker, was credited with this delicious caramel dunked apple treat. 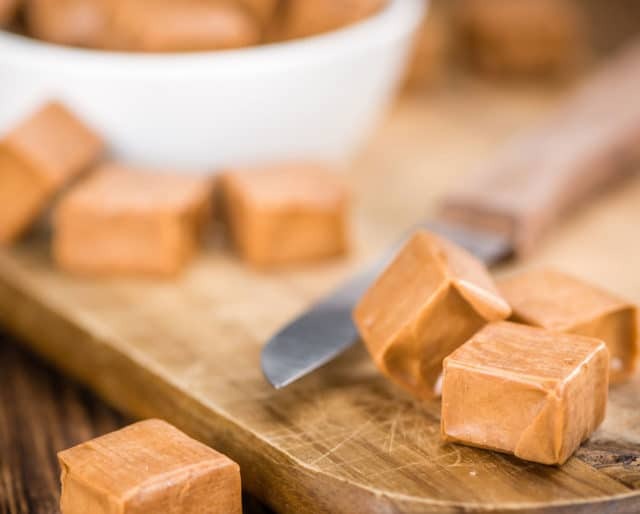 There's evidence dating back to the 1650s that early American settlers were making hard candies —paving the way for the future production of caramels. According to some accounts, it is believed that Ancient Arabs started making the first caramels by crystalizing sugar in boiling water. With only three basic ingredients, mastering a killer caramel recipe is easier than it seems. There are some excellent caramel recipes online, or you can opt to take a cooking class. You're sure to impress your family and friends the next time you show up with homemade caramels! Few treats are as synonymous with the month of October as a caramel apple. Let your imagination run wild with the toppings you choose, although, we must say that the classic caramel and crushed peanut combination is a tried and true favorite. Do you know anyone who is celebrating a birthday, anniversary, or other special occasion in the month of October? If so, why don't you deliver a caramel-themed gift basket as a thoughtful and festive gesture? Caramel popcorn, caramel cake, caramel sundae topping, etc. The possibilities are endless. Caramel was a candy staple for many immigrants because of the simple, affordable ingredients used. Before Milton Hershey ever began producing his famous chocolate candy bars he was known for making delicious caramels. All of the fun isn't just reserved for the month of October. You can also celebrate National Caramel Day on April 5. The English word for caramel is simply derived from the French and Spanish word "caramelo." The cooking processes for caramel candies and the caramel used for apples differ. Melted caramel, for example, can be drizzled over the top of cakes, brownies, and cupcakes to take these delicious desserts to a completely new level. Plus, we can't forget to mention how delicious a caramel sundae is. Caramel also is a great addition to cake frosting, and we wouldn't want to leave out caramel fudge. Yes, you read that correctly. Some of the most basic (and best) recipes for caramel call only for sugar, cream, and butter. The entire cooking process can be a little bit tricky, but with some practice, you're sure to get the hang of it. We can't forget to mention one of the main reasons to love caramel: It is absolutely delicious! Caramel is a satisfying treat any time of year, but there is just something about the rich and creamy taste that signifies the beginning of fall.